Crete is the largest of the Greek islands. The location between three continents has had a big influence on its history and culture. The remains of the Minoans are witnesses of the oldest civilization in Europe. Mycenaeans, Dorians, Romans and Byzantium left their traces. Centuries of occupation by the Venetians and the Turks are still present in form of buildings, memorials and literature, and so is the German invasion during World War II . People are made of places. This is very obvious on Crete. There’s a big difference in inhabitants of the mountain villages, partly still in a traditional way of life, and those who moved to the towns and touristic centers along the coast. But what they all have in common, is their pride and hospitality. The xenos is always welcome and could find himself being invited spontaneously. Respect and honour are important themes, because of their almost continuous struggle for freedom. Angela Sturmayr was born in Austria. Since the middle of the eighties she lives on Crete, which has become her second home country. Through daily life she knows everything about the Greek society and its customs, as well as the history and culture of this beautiful island. Cretan wild flowers and herbs are her passion. Experience in different branches of tourism has teached her to provide her guests with a high standard of services. In years of research she discovered known and unknown paths in East Crete. In 2012 she started the project Mirtos Hiking Village, offering marked paths, walking arrangements and organised walking weeks. In April 2015 the booklet Discover Mirtos…on Foot was published, a joint venture with Berend Wolffenbüttel and Toine van der Meijden of Discoveronfoot.com. In our fast running way of life, there’s a big need for slowing down. People are searching for ways to step out of this constant rush, often having too many duties in their private and working life. Walking is one of those ways, and can be a useful tool to slow down, to stay in the moment, and becoming aware of what’s around us. Trying to take a break from daily life, more and more people spend weeks or sometimes even months on walking long distance routes. Of course, not everyone has the possibility to do this. The time of your holidays is your chance to take this break and to walk, alone or in a guided group. A walk can have more dimensions than one. Although it is a physical activity, walking eases the mind and puts the thoughts to rest. By looking at plants, enjoying beautiful views or watching a bird fly, one comes in contact with nature. The saying the path is the goal becomes reality. To help you with this, we offer unique and individual choices and are able to fit them to your wishes and needs. It is possible to book a walking program only, or a whole package with accommodation and transfer. Even your personal guide can be hired for one or more days. Feel free to “build” your holiday with different elements. In co-operation with our network of travel agencies, apartment holders and booking offices, anything can be arranged. Walking Dimension is the summary of many years of experience in guiding small and partly bigger groups on the beautiful island of Crete. During the years we built up an international network of co-operation. Combining all these connections and working together, we use our knowledge and abilities to give high quality of service. Get inspired by what is already there and let us know your wishes to create your personal program. 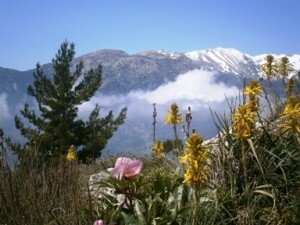 There is a move on Crete, interesting developments which we like to share with you. 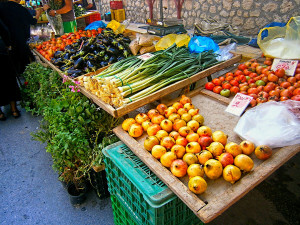 Agroecology, old and new knowledge is being connected to produce high quality of food and other products. 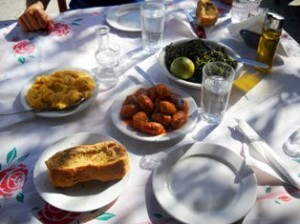 Agrotourism, the Cretan cuisine starts to be creative and a lot more… be surprised, we keep you updated! Be informed of all the details before you book a walking holiday. Get in personal contact with the guide, in order to obtain the right advises and to retrieve useful additional information. You should be in full health and have an average level of fitness for the kind of walks we offer. We advise you to take a personal insurance for your walking holidays. Although your guide is fully trained to handle all kinds of emergencies, she´s not responsible for your physical condition. The average walking time is between 2 ½ and 5 hours, the high distance varies between 150 m up to 600 m. In programs with walks to one of the higher peaks it can be up to 1000 m high distance. During the walk there are breaks for resting, taking pictures and enjoying the views. The size of the group can vary. Our usual walking groups are from 6 to 15 participants. We reserve the right to make changes in the program for safety reasons. 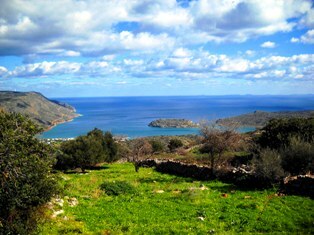 The direct surroundings of Mirtos offer views, old mountain villages, Minoan settlements, a gorge and much more. Because many guests asked for walking routes in the region, in 2012 Mirtos Hiking Village started to mark the paths around the village. Both having cooperation as their philosophy, Discover on Foot and Walking Dimension shared their knowledge and their work with a great result. A colourful guide with 9 marked walks around the village and plenty of information about Mirtos is now available for the visitors. Ask for the booklet in your accommodation or in the local stores.